Looking for a challenge? Whether you’re actively seeking new opportunities or not, you’ll encounter a pregnant client at some point in your wedding planning career. While most tasks will remain the same compared to non-expecting clients, there are special considerations when the bride is with child. Remember, not every bride will be at exactly 5 months pregnant on their big day. Sometimes you’ll find out about the pregnancy late into the game, and sometimes they’ll be walking down the aisle late into the game! Trust us, it’s a game-changing factor. So do yourself a favor and find out how to accommodate an expecting couple…keep reading! Regardless of whether a bride is pregnant or not, having a comfortable dress should be a priority! Especially for a day-long affair, the last thing any bride wants is a dress that weighs her down and restricts blood flow. Even worse if she has a full, tulle gown and needs to frequent the washroom often. The bride will be on her feet for much of the day after saying “I do”—rushing around thanking every guest who came out. So, she’ll need a dress that is both fashionable and functional. And if she’s always envisioned herself walking down the aisle in a non-stretch mermaid dress? The option isn’t completely out the window! Many bridal shops specializing in maternity wear have sprung up in recent years. They provide the same silhouettes your client knows and loves but with more forgiving fabrics and details. There’s no reason why your client can’t have the wedding dress of her dreams! Research a variety of different dress silhouettes. Some are better suited than others when it comes to accommodating pregnancy. 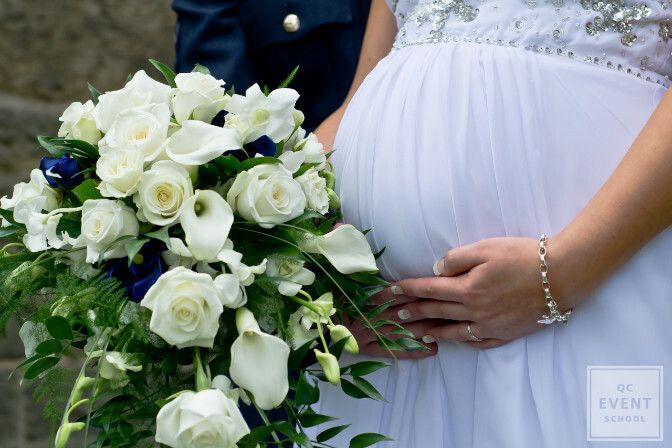 There used to be a stigma regarding pregnant brides, but that’s all in the past. Nowadays, more and more brides aren’t afraid to let their growing bump show! Everyone in attendance is probably aware of the pregnancy anyway, so there’s no need to hide it. But if you have a client who prefers to conceal the bump during the celebrations, that’s fine, too. There are a variety of different decorative adages that could make their choice dress conform to their needs. This isn’t by any means an exhaustive list of tips. Depending on the event’s season, theme, and timing, you’ll have many more considerations. Solutions and exceptions will come organically to you throughout the process. Just take care to listen to your client, and you’ll be fine! But just to help you out for your first time, here are our best-kept tips! Ensure there are plenty of non-alcoholic options readily available. 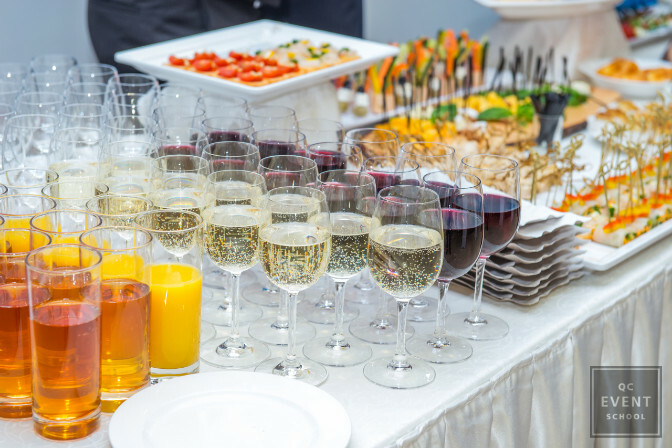 From the open bar to the champagne toast, your catering vendors should provide refreshments for the bride that are as refreshing and festive as their alcoholic counterparts! The bride should be able to take a rest whenever she pleases. A comfortable space so she can step away when she gets exhausted. Snacks and plenty of water should be available to keep her fueled and energetic. Speaking of foods… many brides actually forget to eat! Being on her feet all day, she’s likely going to forgo eating. Remind her to take time to care for herself. The guests will understand if she’s taking a quick break before getting back on her feet. She’s eating for two, after all! Depending on her stage of pregnancy, she should have a pair of comfortable flats on hand. Many women get swollen feet during pregnancy! The same goes for the wedding ring. Her fingers may swell a bit, so ensure a larger ring is on hand. It can always be resized later on. If your clients are expecting the new member of their family to arrive close to the big day, they may consider combining their wedding with a baby shower. But it’s not for everyone. These are two momentous occasions, and it can be too much trying to cram it all into one day. As such, some choose to just celebrate their union on their wedding day and keep it separate from their baby shower. Really take the time to sit down with your clients to figure out what they want. When a pregnancy is underway, people often become overwhelmed. Who can blame them? Changes need to happen fairly quickly after receiving the news. Everyone knows that the best decisions aren’t rushed, so let them know it’s okay to take things one step at a time. If your client wants to celebrate just their marriage on the big day, they don’t need to completely shun all talk of the pregnancy. A wishing well for the baby or a mention by the toaster allows them to recognize new life without shifting the central focus of the wedding away. Depending on what stage of the pregnancy they’re on, they may not be able to board a plane. You can imagine how much this affects any destination wedding plans! But before making any drastic decisions, ask them to consult their doctor. They’ll be able to best advise your client on whether or not she could proceed. They should provide your client with documentation stating their blood time and expected delivery date. Airlines usually request to see this information, so ensure everything goes without a hitch! If your client will be 36 weeks into her pregnancy at the time of the wedding, she’ll likely have to reschedule the big day. Meet with the various vendors you’re coordinating, and see what options they may have. Provided they’re available at a later date, your clients won’t lose their deposit. Oh, and make sure she purchases an appropriate travel insurance package for her needs before boarding the plane. Simply having a safety net will save them a lot of grief. Bonus tip: Ensure your bride wears copious amounts of sunscreen! 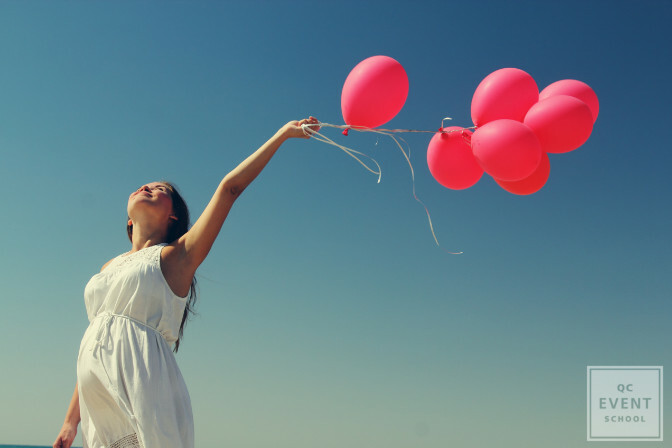 When pregnant, hormonal changes cause the skin to be more vulnerable to the sun. Besides direct sunlight, large bodies of water at beachside weddings reflect more light on the vulnerable bride. Many artists won’t use SPF on the big day as SPF tends to reflect light, resulting in odd looking photos. Your bride’s health is more important, so consult the artist and ensure the bride is doused in sunscreen providing at least SPF 30 protection. Have you ever dealt with any unsuspected surprises? How did it go? Let us know! Speaking of destination weddings… check out these 7 offbeat wedding destinations around the world!